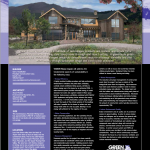 Green Builder Magazine, the most read publication in green building, chose NCFI to insulate its VISION House 2009 in Aspen. VISION House utilizes site-specific solutions for solving key green building issues including energy, water, land, resource use, waste management, and indoor environment quality. Former VISION Houses have been written up in publications such as the Wall Street Journal, Chicago Tribune, LA Times, and have been on the NBC nightly new and the Today Show magazine. 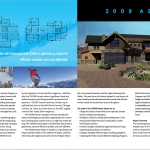 InsulStar® was chosen to insulate the VISION House in Aspen, CO because of its superior performance among sustainable building products. It super-insulates in any environment and eliminates dangerous and damaging ice dams found in high-mountain, cold climate areas. Architects and builders know InsulStar® is ideal for achieving and exceeding LEED® certifications. The closed-cell foam is referred to as high-performance insulation because it is spray-applied by trained and certified applicators, fills every crack and crevice in the walls, ceilings, basement, crawlspaces, and attic, expands then cures in place to form a solid blanket of comfort. InsulStar® is an air and moisture barrier so it eliminates water condensation and danger from mold and mildew, plus, includes an anti-microbial agent. InsulStar® saves trees too. Its high R-value allows designers to reduce the depth of a home’s exterior walls and still obtain amazing energy efficiency. This means more living space and a greatly reduced amount of lumber-two whole trees less for a 2,500 square-foot home! NCFI is a member of the U.S. Green Building Council, and the Sustainable Buildings Industries Council. The future of U.S. green, sustainable building is intertwined with that of energy efficiency. You cannot build a green home without considering the efficient use of energy. Regardless of the type of energy source you choose-electric, solar, wind; if you’re not economical with its use, your home cannot be considered a sustainable abode. The answer, according to most experts is high performance insulation. In fact, a recent McKinsey & Co. global energy report claims insulation is the single most cost-effective way to improve energy efficiency based on cost comparison per square foot. NCFI is one of the country’s most innovative spray foam insulation companies. They pioneered high performance spray foam insulation as early as 1966 and continue to lead the formulation of new and better products. The company’s InsulStar® spray foam insulation is recognized as a breakthrough green building product (EnergyStar certified) that can lower energy costs by as much as 60 percent. Our service representatives are available to answer questions about your foam needs.